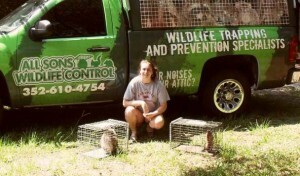 Allsons Wildlife Control is locally owned and operated with 25 years’ experience. A member of NWCOA and the WildLifePro Network. Our concept calls for humane nuisance animal removal and environmentally responsible techniques for handling nuisance animal problems. We use innovative, integrated methods to provide ecologically sound nuisance animal removal management services for homeowners, businesses and municipalities. We offer both residential nuisance animal removal and commercial animal removal throughout all of Hernando, Pasco and Citrus Counties. We routinely handle the removal of raccoons, rats, bats, rodents, squirrels, armadillo’s, opossums, fox, gophers and snakes. We have the professional wildlife management and nuisance animal removal solutions you need. Allsons Wildlife Control is a full service nuisance animal control organization. We are certified in nuisance animal control , animal removal and ,animal damage control. We remove nuisance wildlife animals and prevent them from returning through the use of efficient animal control prevention techniques. Allsons Wildlife Control will find every point of entry for unwanted animals, from raccoons in the attic to mice in the walls. We implement our prevention strategies to ensure the elimination of recurrent wildlife invasions, including using screening vents, installing chimney caps, and closing entry holes.